Can you prove the ROI of your marketing? Here are the top challenges we're all facing. As marketers we are constantly juggling more projects than seems possible at times – planning the next campaign, delivering the current one as well as all the BAU activity of Email, Automation, Social, linking with the sales team and meeting…oh the meetings. It can feel like your in a whirlwind even with the most well thought out plans but one of the most turbulent times can be when you need to report on the ROI of particular activities. How do you find the right data? Is it accurate? How should your present it? It’s hard. 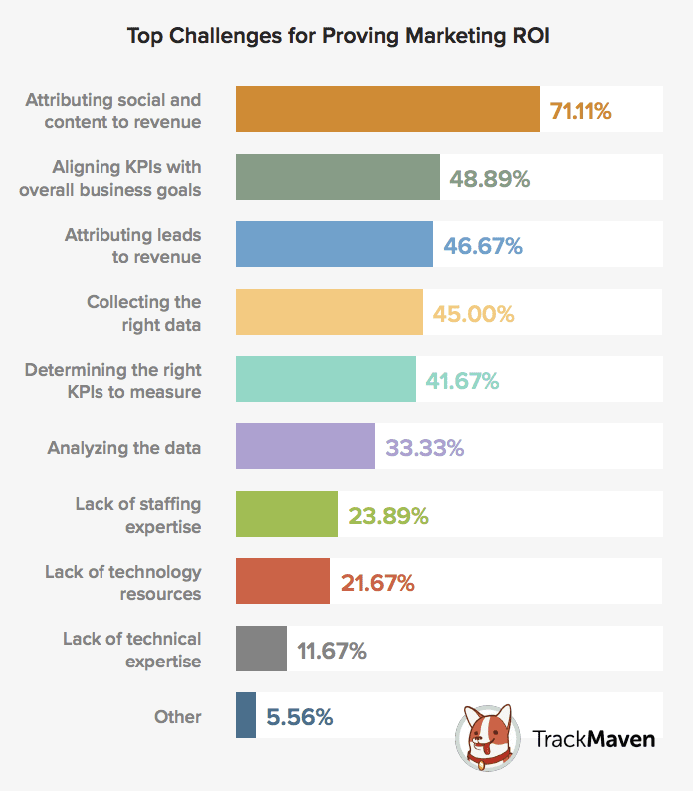 In a recent survey, TrackMaven asked marketers from 19 different industries what they were finding the most challenging when attempting to prove the ROI of their marketing. Of the many options, they could choose from attributing social and content to revenue leading the pack, followed up by aligning KPIs with overall business goals and attributing. Proving the ROI on your investment in content production has always been particularly tricky to measure as all the analytics platforms (Google Analytics/Adobe Analytics) focus on reporting by channels e.g. Email, Paid Search, SEO etc. Even using the most sophisticated attribution models will not tell you if it was worth spending your marketing budget on a new long-form blog post or ebook. If you have all three of these you will be able to report on the impact of each piece of content has had on each marketing channel from impression through the click and lead to the final sale and beyond via combining your campaign report and your financial reports. These challenges can all be conquered but it requires you to take a step back from your marketing production line, discover the right KPIs for your business and utilize the tools you and/or configure some new tools to fit your needs. It can be painstaking at the time to get it all working and be accurate but once it’s all working proving the ROI on your activities should take minutes.